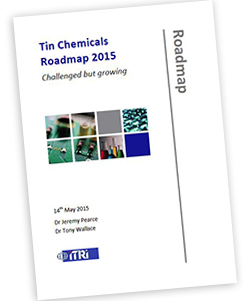 Tin chemicals represented 16.5% of tin use in 2013 and may grow by around 7% in 2014 to become the second largest use of tin. Some products are sensitive to substitution with tin price and regulation both significant threats, especially in Europe. There are some concerns over tin supply, including ethical sourcing regulation, but the industry is responding robustly. The largest use sector is PVC stabilisers where tin products have particular technical merit. Strong regulatory pressures and competition from cheaper calcium-zinc alternatives have significantly decreased markets in Europe but growth in China and SE Asia is strong based on increased PVC use there. Continued phase out of lead stabilisers may benefit tin particularly in China and especially for potable water pipes. Methyltin products are likely to become the focus of future use as butyltins are being phased out and octyltins are now under some pressure. Catalyst markets are under similar regulatory pressures in Europe and some producers are marketing ‘tin-free’ products. The major product, stannous octoate, may also have issues with the octoate component. However markets for their application in silicones and polyurethane are strong and competitive products are still more expensive. The very many smaller catalytic uses of tin continue to abound, including organic synthesis and some remarkable examples in carbon capture. A number of tin chemical variants are used in the traditional markets for electroplating including engineering, tinplate, wires and giftware. In general the high price of tin has brought this market into gradual decline in recent years, although some specialist innovative applications may grow. A supplier in China recently reported strong growth in sales. Other traditional markets such as ceramics and pigments are likely to be relatively stable, with some gains from newer products compensating for declines in more traditional uses. Other uses include cement additives, brake pads, fire retardants and a number of medical applications. New use may focus on a range of energy and electronics materials including lithium-ion batteries, solar cells, thermoelectric materials and photocatalysts.